Form No. 4.-100 - 17.8.10. Delivery Date 14 APR 1912. No. 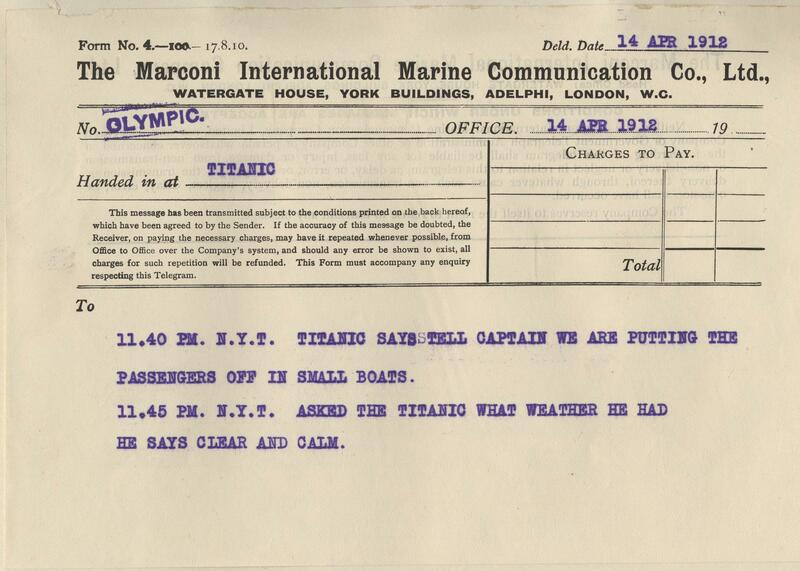 OLYMPIC, Handed in at TITANIC. To : 11.40 PM. N.Y.T. TITANIC SAYS TELL CAPTAIN WE ARE PUTTING THE PASSENGERS OFF IN SMALL BOATS. 11.45 PM. N.Y.T. ASKED THE TITANIC WHAT WEATHER HE HAD HE SAYS CLEAR AND CALM.